Understanding and predicting the behaviour of natural and human environmental systems is crucial for the effective management of the Earth’s limited resources. Recently, great advances have been made through spatial modelling. This book provides a snapshot of the latest research in modelling technologies and methodologies within five environmental fields; the cryosphere, hydrology, geomorphology, vegetation interfaces and urban environments. 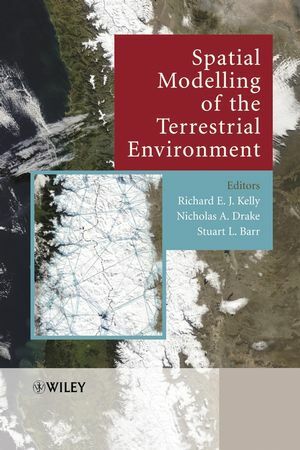 Spatial Modelling of the Terrestrial Environment deals with the use of remote sensing, numerical models and GIS in addressing important natural and human environmental sciences issues, focusing on the theory and application of modelling remotely sensed data within the context of environmental processes. Extensive case material exemplifies the latest research and modelling paradigms presented in the book. Richard E. J. Kelly is the editor of Spatial Modelling of the Terrestrial Environment, published by Wiley. Nicholas A. Drake is the editor of Spatial Modelling of the Terrestrial Environment, published by Wiley. Stuart L. Barr is the editor of Spatial Modelling of the Terrestrial Environment, published by Wiley. 1. Spatial Modelling of the Terrestrial Environment: The Coupling of Remote Sensing with Spatial Models (Richard E.J. Kelly, Nicholas A. Drake and Stuart L. Barr). Editorial: Spatial Modelling in Hydrology (Richard E.J. Kelly). 2. Modelling Ice Sheet Dynamics with the Aid of Satellite Derived Topography (Jonathan L. Bamber). 3. Using Remote Sensing and Spatial Models to Monitor Snow Depth and Snow Water Equivalent (Richard E. J. Kelly, Alfred T. C. Chang, James L. Foster and Dorothy K. Hall). 4. Using Coupled Land Surface and Microwave Emission Models to Address Issues in Satellite-Based Estimates of Soil Moisture (Eleanor J. Burke, R. Chawn Harlow and W. James Shuttleworth). 5. Flood Inundation Modelling Using LiDAR and SAR Data (P.D. Bates, M.S. Horritt, D. Cobby and D. Mason). PART II: TERRESTRIAL SEDIMENT AND HEAT FLUX APPLICATIONS. Editorial: Terrestrial Sediment and Heat Fluxes (Nicholas A. Drake). 6. Remotely-Sensed Topographic Data for River Channel Research: The Identification, Explanation and Management of Error (Stuart N. Lane, Simon C. Reid, Richard M. Westaway and D. Murray Hicks). 7. Modeling Wind Erosion and Dust Emission on Vegetated Surfaces (G. S. Okin and D. A. Gillette). 8. Near Real-Time Modelling of Regional Scale Soil Erosion Using AVHRR and METEOSAT Data: A Tool for Monitoring the Impact of Sediment Yield on the Biodiversity of Lake Tanganyika (Nicholas A. Drake, Xiaoyang Zhang, Elias Symeonakis, Martin Wooster, Graeme Patterson and Ross Bryant). 9. Estimation of Energy Emissions, Fireline Intensity and Biomass Consumption in Wildland Fires: A Potential Approach Using Remotely Sensed Fire Radiative Energy (M.J. Wooster, G. Perry, B. Zhukov and D. Oertel). PART III: SPATIAL MODELLING OF URBAN SYSTEM DYNAMICS. Editorial: Spatial Modelling of Urban System Dynamics (Stuart L. Barr). 10. Characterizing Land Use in Urban Systems via Built-Form Connectivity Models (Stuart L. Barr and Mike Barnsley). 11. Modelling the Impact of Traffic Emissions on the Urban Environment: A New Approach Using Remotely Sensed Data (B.J. Devereux, L.S. Devereux and C. Lindsay). PART IV: CURRENT CHALLENGES AND FUTURE DIRECTIONS. 12. Land, Water and Energy Data Assimilation (David L. Toll and Paul R. Houser). 13. Spatial Modelling of the Terrestrial Environment: Outlook (Richard E.J. Kelly, Nicholas A. Drake and Stuart L. Barr).